In this Monday, Oct. 27, 2014 photo, Iraqi army soldiers aim their weapons on the front line with the Islamic State in Jurf al-Sakhar, 43 miles (70 kilometers) south of Baghdad, Iraq. Jurf al-Sakhar is part of a predominantly Sunni ribbon of territory that runs just south of Baghdad and lies on a road usually taken by Shiite pilgrims to the holy Shiite city of Karbala further south. BAGHDAD—Islamic State fighters killed at least 40 Sunni tribal fighters and security forces personnel in a public mass execution that is likely to further damp enthusiasm among Sunni Arabs for fighting the powerful insurgent group. Sabah Karhout, the head of the provincial council of Anbar in western Iraq, said Islamic State fighters paraded 40 fighters from the Albu Nimr tribe through downtown Hit, a city 85 miles west of Baghdad, on Wednesday afternoon before shooting and killing them in front of local residents in the city’s central square. Reports from Islamic State sources on Twitter said the group killed as many as 46 men in Hit. Eyewitnesses took photographs of the shooting’s aftermath that showed nearly two dozen bloodied corpses lying in a row on an urban street. The images’ authenticity couldn’t be independently verified. The execution-style deaths add to Iraqi security forces’ considerable woes. Such killings aren’t an uncommon tactic for Islamic State, but this is the first such mass shooting in Anbar province, where Sunni tribes such as Albu Nimr have labored to reinvigorate the so-called Awakening tribal councils whom the U.S. enlisted years ago to join in the fight against al Qaeda in Iraq. The government has so far been slow in responding to Sunni tribes’ requests for more support and materiel, according to tribal leaders. Wednesday’s massacre is likely to amplify such complaints and Sunni distrust of Iraq’s Shiite-dominated government. “We requested many times from the security commanders, the Iraqi government, and other security leaders to provide us with arms to fight Islamic State but nobody listened to us until what happened today,” said Sheik Ghazi Faisal Al-Gu’od, a member of parliament and an Albu Nimr leader. 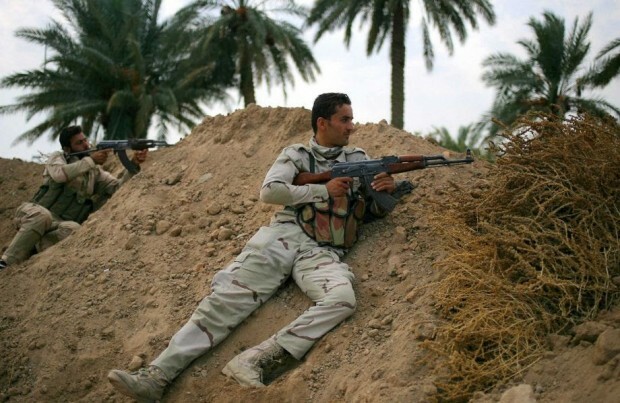 Iraq’s government is helping Sunni tribal councils fight Islamic State forces in Anbar province. But many Sunni tribal fighters remain suspicious of the Shiite-dominated government in Baghdad, which they accuse of persecuting Sunnis. Iraq’s new Prime Minister Haider al-Abadi has sought to improve relations with the Sunni tribes to coax them into rejecting Islamic State and joining the fight against it. Mr. Abadi has arranged meetings with Sunni tribal leaders in Amman, the capital of neighboring Jordan. Baghdad desperately needs the help of the Sunni tribes. Islamic State insurgents humiliated Iraq’s military by seizing about a quarter of the country’s northwest region when it launched an aggressive blitz over the summer. In the nearly five months since, Iraq’s government has been mostly unable to reconstitute its broken military to launch a counterattack. Thanks to tribal fighters like those from Albu Nimr, Hit was one of the last Anbar towns to hold out against Islamic State forces. But without the aid of reserve troops from Iraq’s military, the town fell to the insurgent group only a few days ago. It was then that Islamic State captured the tribal fighters, said local residents who didn’t want their names used.